When Must you Do a Literature Search? A vast amount of published information exists for researchers looking for ways to reduce, refine, or replace their use of animal subjects in research. This information may be found in a number of databases and online web directories. 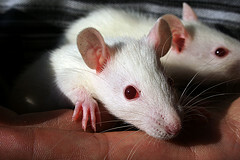 It includes articles, books, and tools for animal and computer models, guidelines for and research into animal husbandry (including caging, handling, and blood sampling), and alternate approaches to commonly-studied diseases. Searching for articles and other published literature on a topic is a multi-step process. This learning module is designed to help you perform your own searches for research alternatives. Additionally, if you would like to meet with a librarian to discuss your search, we are more than happy to help you. Please refer to the Ask a Librarian page to ask questions or request a consultation appointment. How do I use this tutorial? Read each section in order, completing the self-quiz at the end of each section. When you are finished, you may choose to print out a Certificate of completion using the link at left. You must do a specific literature search for every proposed animal research project to find all possible alternatives to using complex animals or painful/distressing procedures. New and better methods are discovered and shared every day; make sure that you make a good faith effort to find them. You must record and update the required information each and every time. You are legally required to perform and record an appropriate literature search when engaged in animal research. Under Section 2143 of the Animal Welfare Act, the principal investigator on a research project must ensure that alternatives to painful procedures have been examined.